Plot: Ever since she started going out with Rogerson Biscoe, Caitlin seems to have fallen into a semiconscious dreamland where nothing is quite real. Rogerson is different from anyone Caitlin has ever known. He’s magnetic. He’s compelling. He’s dangerous. Being with him makes Caitlin forget about everything else–her missing sister, her withdrawn mother, her lackluster life. But what happens when being with Rogerson becomes a larger problem than being without him? 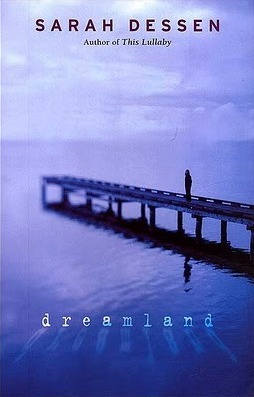 Opinion: I have read Dreamland quite a few times over the past ten or so years that I have owned it (wow, time flies), and I can honestly say that it has and always will be one of my FAVORITES. Every time I pick this book up after some time has passed, I feel like I am seeing it in a completely different way. Maybe it has to do with me getting older and appreciating beautiful writing as it is, or maybe it is life experiences that I have encountered that have given me an even deeper connection to it. But really, the most amazing aspect of this entire book is this: no matter your age or your experiences in life, it is near impossible not to feel a deep connection or understanding to the characters or events that take place in this story. Caitlin has always felt like she was living in the shadow of her perfect older sister Cass. But when Cass runs away on Caitlin’s sixteenth birthday, Caitlin is left to deal with the emotional turmoil it leaves on their family and to fill the place of her older sister. As Caitlin and her family start to live their lives without Cass in it, Caitlin tries to forge her own path in life without following in Cass’s perfect footsteps. Soon Caitlin meets Rogerson, a mysterious guy that at first seems to be Caitlin’s perfect match. But too soon their relationship turns from beautiful to ugly, and Caitlin slowly starts to withdraw from everyone and everything around her. Though I have read this book many times over the years, I feel like this time I feel COMPLETELY different about it…in a good way. When I was in high school, I connected with the character of Caitlin easily because she was young and trying to figure out who she was and what she wanted out of life. Not only was she trying to become her own person, but she was trying to be something different than her older sister. Back then I saw this book as a young adult love story gone wrong, with a main character who was so far in love that she could not get herself away from the terrifying situation of Rogerson and his fists. I couldn’t understand why Caitlin wouldn’t run away from Rogerson, flip him the bird, and go on with her life. Now, several years later (and older and wiser… 😉 ), I have come to see a few differences. Not only does Sarah Dessen know how to do wonderful transitions from dialogue to memories that Caitlin has with her sister, but she has a beautiful creative writing ability. When Caitlin is describing the toll her relationship is taking on her, the reader feels entirely encompassed in her feelings. I found myself going on an emotional roller coaster with her as she went through it. “But what he didn’t understand was that this dreamland was preferable, walking through this life half-sleeping, everything at arm’s length or farther away. I of course took a look at some other reviews of this book, and I noticed that many readers were commenting on how Rogerson was just another made up “bad boy” and that nothing about him was explained. I personally think that the author not giving away too much on Rogerson is spot on. A lot of times with relationships that involve physical or emotional harm, the person being harmed in the relationship starts to realize that the person they fell in love with is a stranger to them after all. I think the reader never knowing exactly why Rogerson hit Caitlin (obviously his father beating him had something to do with it) or exactly who he was just built his character even more. Sarah Dessen did a great job of getting the reader attached to him just as much as Caitlin was, and I find that a hard thing to do. This is a darker read for a Sarah Dessen book, but is ABSOLUTELY worth the read. It is perfect for all ages (as it doesn’t get too violent) and I think shows a great outlook and insight into relationships that can turn to something unexpected.